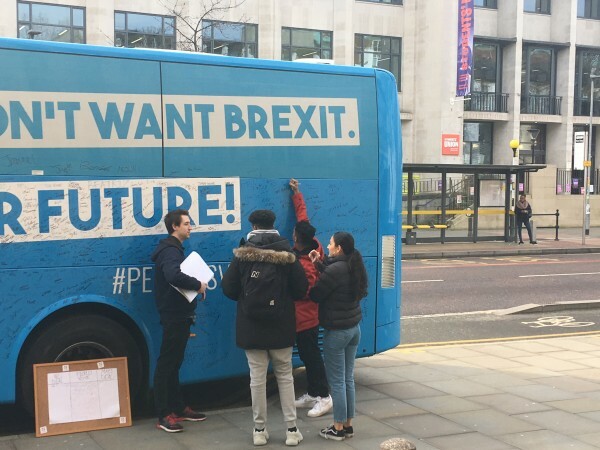 Supporters of a second Brexit referendum were campaigning in Manchester today to spread their message to young people. Our Future Our Choice, who want a public vote on the withdrawal from the EU in regards to the deal negotiated since the 2016 referendum campained outside the University of Manchester and Royal Northern College of Music to win support of students and young people. 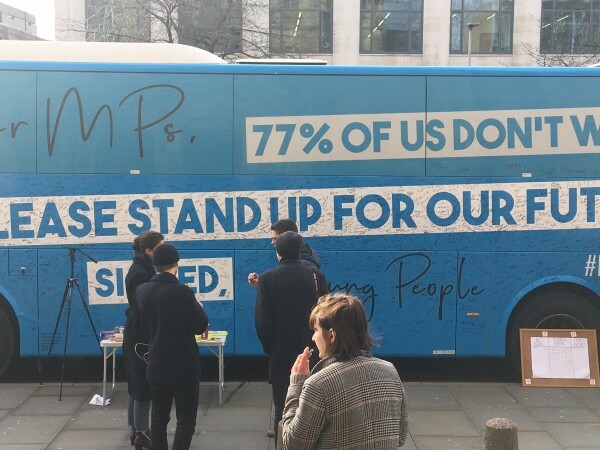 In a clear reference to the infamous £350bn to the NHS bus used by Vote Leave in the 2016 referendum, OFOC's bus was emblazoned with the slogan: "Dear MPs, 77% of us don't want Brexit. Please stand up for our future! Signed, young people." 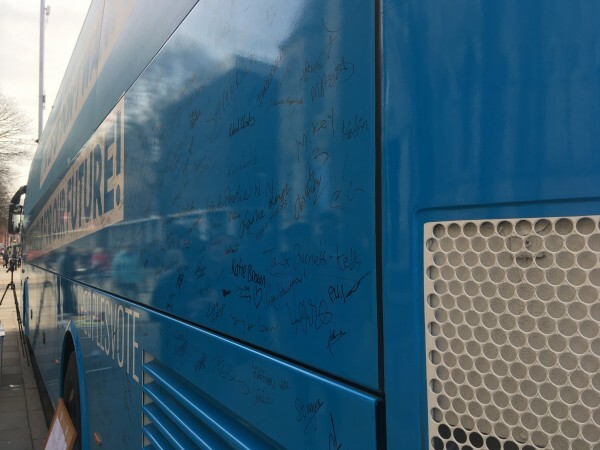 People were encouraged to add their signatures to the bus as they went past. Hugo Lucas, communications officer for OFOC said: "We want a people's vote with the option to remain for the sake of young people, for the sake of our futures." Plenty of people were stopping to sign the bus and talk to the campaigners, but many also seemed apathetic to it; ignoring the campaigners, saying they didn't care or some even crossing the road to avoid them. What a second referendum would look like is a point of contention for some people, but Hugo said: "I think it's really dangerous to include a unicorn on the ballot paper and that's what we had in 2016. We had a clearly defined Remain option and a very unclearly defined Leave option which allowed people to say a lot of different things about what Leave would mean. "Now we've got Brexiteers tearing themselves apart. We had two chairs of Vote Leave on opposite sides of the division lobby when Theresa May's deal got voted down. It's not clear to anyone what Leave means despite people saying 'Brexit means Brexit!'" One of the main arguments against a people's vote says the 2016 referendum caused division between Leavers and Remainers in the UK and another referendum could make these divisions even worse. Hugo said: "I think the 2016 referendum actually exposed divisions rather than caused them. "The option we've got now, Theresa May's deal, if we leave with that, it was at one point less popular than the poll tax! You've got something that only 20% of the country actually want and if you go through with that sort of option, you've got half the Brexiteers who don't want that option, all of the 48% who don't want that option. "I think it's better that, whichever way people vote, even if we do vote to leave, which I think is quite unlikely, there will at least be a sense of unification that people voted on facts, people voted on a deal that they knew was workable - after that happens we will be able to unite as a country behind it." The battle bus will go to Edge Hill University in Bolton tomorrow and will be in the Midlands next week. You can watch the interview with Hugo on NQ's Facebook page.